Slot-O-Matic Classic Slot Review - Casino Answers! Slot-O-Matic is a 4-reel, 1-line classic slot machine developed by Slotland, featuring a bonus reel and a progressive jackpot. You can play the Slot-O-Matic classic slot machine at Win A Day Casino. Bets on the Slot-O-Matic slot machine are $0.25, $0.50, $0.75, $1, $1.50, $2, $3 and $5. If you want to play for the Slot-O-Matic Progressive Jackpot, you must play the $5 maximum bet. Slot-O-Matic has a decent betting range that is suitable for most online slots players. To play the Slot-O-Matic classic slot, press the “Spin” button. If you get two matching symbols, you can hit the “Spin” button once again to spin the bonus reel. Slot-O-Matic is linked to a casino-wide progressive jackpot. The progressive jackpot is currently at $35,797 at the time of this writing. If you get three Dollar symbols while making the $5 maximum bet, you will win this progressive jackpot. If you aren’t making the maximum bet, you will instead win the 250 coin top fixed payout. You can play for the Slot-O-Matic Progressive Jackpot when you sign up and make a real money deposit at Win A Day Casino! Slot-O-Matic has a fourth reel that is its Bonus Reel. If you land matching two symbols of any winning combination, you can complete that winning combination by spinning the Bonus Reel. All you have to do is press the “Spin” button a second time. Spinning the Bonus Reel is free and will not cost anything extra. There are 9 winning combinations on the Slot-O-Matic classic slot machine. The complete payout schedule is as follows (payouts in parenthesis): any 3 Fruit symbols (1), 3 Cherry symbols (2), 3 Plum symbols (4), 3 Lemon symbols (10), 3 Watermelon symbols (15), 3 Seven symbols (25), 3 Bar symbols (50), 3 Diamond symbols (100) and 3 Dollar symbols (250). Slot-O-Matic has a basic autoplay mode that you can use. Click the arrow symbol near the top right part of the screen to open up the autoplay mode options. You will be able to select 5, 10, 25, 50 or 100 autoplay spins. You can speed up the gameplay by skipping animations on winning combinations. Triggering the scatter feature or the bonus game will bring the autoplay mode to a halt. You can stop the Slot-O-Matic autoplay mode at any time by pressing the autoplay mode button. Warning: Due to frequent winning combinations, the Slot-O-Matic slot game has proven to be highly addicting. Proceed at your own risk of having too much fun while winning the progressive jackpot! 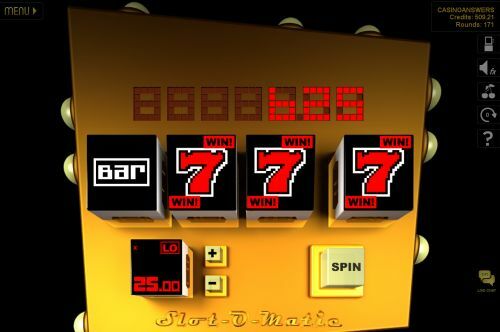 You can try the Slot-O-Matic online slot game out when you play at Win A Day Casino! Can USA players play the Slot-O-Matic online slot for real money? Yes, if you are located in the United States of America, you are welcome to play the Slot-O-Matic slot machine when you sign up at Win A Day Casino. Do I need to download any casino software to play the Slot-O-Matic casino game? No, there is no casino software to download at Win A Day Casino. You can play for free or real money. For optimum performance, make sure you have the latest release of Adobe Flash Player.